Taverns were very important in the early development of most communities. They were the chief center of life and news of the community. When stagecoaches arrived with strangers from big cities, many of the principal men of the place gathered at the hostelry to welcome the pilgrims, question them, and listen to the news they had brought from the outside world. John Snyder was the only hotel keeper in Walker Township in 1825. When Judge McKinney built Hecla Furnace in 1826, several more hotels were needed to accommodate travelers who were doing business with the furnace, so Andrew McKee built The Hublersburg Hotel in 1827. He only ran it a few years, for in 1832 when Hublersburg was a town of about six houses he exchanged land with John Geary, who had built the Nittany Inn. The land was exchanged in an article of agreement, but Andrew died in 1833, and there were complications with the deed. It is uncertain if it was ever recorded as such. John Geary ran a tavern at Hublersburg until 1840, when he sold to John Orr. Almost as soon as he sold the hotel he left his family for parts unknown. He left behind his wife Julia and daughter Susanna who had just married Benjamin McDowell Hall in 1837. John Orr took over ownership of the hotel in about 1840 along with his wife Rachael. He also had a daughter named Rachael, who must have helped with the general chores of running a tavern. John Orr left Hublersburg to run the Nittany Inn in 1848 when John C. Coverly gave up that place. 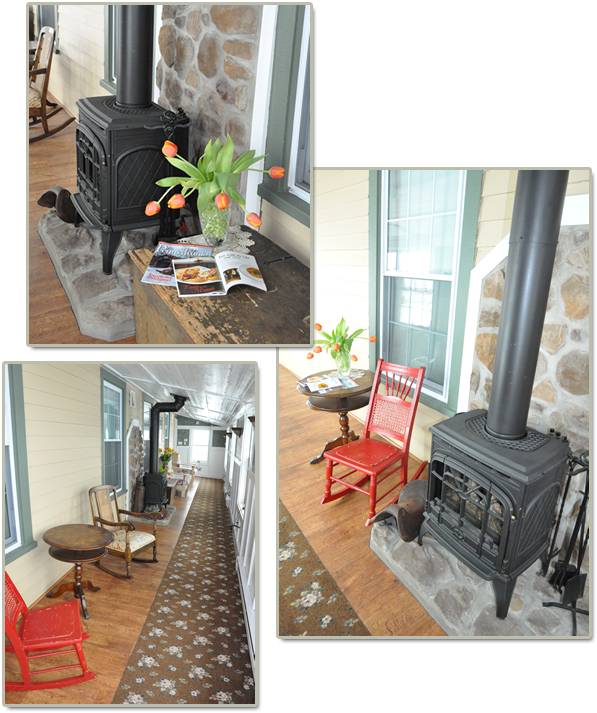 When Hecla Furnace closed in 1866, Anthony decided to sell the hotel. Joeseph Shaffer, who had been a blacksmith, and wife Catherine, bought the hotel in April of 1866. They didn't keep it more than a year, because in April 1867, they transferred it to Christina Hubler of Haines Township. Christina was a daughter-in-law of Jacob Hubler, who laid out the town of Hublersburg in 1832. She was quite an aged lady when she came to Hublersburg, so she brought her son Michael to be the inkeeper. Another son, John David, came to practice dentistry. Several daughters also came: Phoebe, who died soon after; Mariah; and Henrietta, who married John C. Carner. Realizing that she might not have long to live, Christina deeded her property to her children and heirs, but she continued as the hotel's landlady. In 1871, this property supposedly went up for sheriff sale. In January of 1872, Elisha Elliot bought the hotel property for $12. I'm not sure why, but the Hublers retained ownership. About this time, an article about the stagecoach that went to Hublersburg appeared in the Democratic Watchman. It stated, "The vehicle erroneously called a coach that plies between Bellfonte and Hublersburg is a disgrace to civilization and an infernal imposition upon the public, who are compelled to travel on it. It is nothing but a one horse wagon with only one seat, the driver's, and no protection whatever against heat, cold, and storm. If more than one passenger wants to go in it, a board is placed across the wagon bed for a seat, and then the miserable victim is nearly jolted to death before he reaches his destination. The rate is a dollar a head to Hublersburg." I'm sire this type of publicity didn't much help the hotel's business. Nelson George was the stage line's proprietor. The following Hublers were living at the hotel in 1880: Christina was 78, Michael, her son, 57, was the hotelkeeper, sister Maria or Mariah age 45, and Regina, niece, age 19. Christina died in 1880 and Michael in 1888, so this left Mariah as the hotelkeeper with Regina helping her. Together these ladies ran more of a boarding house than a hotel, for no liquor was sold. 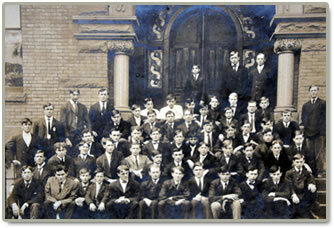 They were members of the Reformed Church, and often held church socials at the hotel. The men of the town often received lectures on tobacco chewing and smoking from the ladies. When Mariah died in 1903, she left her interest to Regina. Madge Carner Quick, a former Hublersburg resident, recalls that Regina Hubler was quite a large lady. When a new privy was built at the hotel, they had to put a special hole in it for Regina. Madge's mother would not let her go to the privy at the hotel, for fear of Madge falling through if she used this particular hole. Regina was the proprietor until 1913, when she passed away. In her will, she gave all her real and personal property to her aunt Rebecca Charles. After Rebecca's death, the hotel was to be sold and a suitable stone or marker was to be bought and placed on the Hubler lot with the inscription as follows: "In Memory Of The Hublers", and a headstone for each of the Hublers buried there. Rebecca left all of the furnishings of the hotel and her share of the real estate to Magdalena Weaver, who had taken care of her during her illness. In 1920 when the furnishings were sold in fourteen rooms, the dining room, the living room, the bar, the hall, and the kitchen of the hotel, $194.25 was realized. When the hotel was not used as a hotel, several families lived in it for a few years. One was Robert McCloskey and another was the William Poorman family. It was then that George W. Ferguson, an African-American and proprietor of the Boal Tavern, was preparing to move to Hublersburg and take over management of the hotel and perhaps had even purchased it. He died before this could be realized. It was a sad situation, because the day after he died, his wife gave birth to a child. 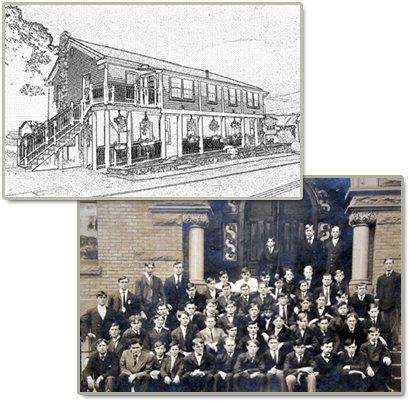 The property stayed in the name of the Hubler heirs until December of 1926, when it was sold to J. McClellan Davis. Audrey Hall, former postmistress of Hublersburg, said, "This was when some majory improvements had been done.". This must have been when the upper and lower porches were added. On October 24, 1929, Cynthia Dean purchased it from J. McClellan Davis. The next year there is another deed transfer from Cynthia Dean and Fay Dean, her husband, of Hublersburg, to J. McClellan Davis of Tyrone, Blair County. It was about this time that the hotel became known as "Ye Old Tavern", which often appears on signs in pictures of this building. J. McClellan Davis passed away in 1931, and his widow and sins transferred the hotel to Gertrude Flick, August 13, 1935. She purchased all of the furniture and fixtures. It was Gertrude's intention to cater to the public in general, specializing in Sunday dinners, as well as catering to different societies, bridge parties, etc. One of her specialties was Southern-style chicken dinners. William J. Myers next purchased the property on December 5, 1945. He kept it until he sold it to Joseph J. Rozgay and his wife, Mary, on August 4, 1950. They did some remodeling around 1965-1966 and moved the bar from the far left side to the right end near the kitchen. They also removed a wall that partitioned the bar area from the hall. This increased the dining room area. The big bands that came to play at Hecla stayed at the hotel quite often. The Rozgays ran the hotel until 1972, when Joe's daughter, Sarah, or Sally as we all know her, took over ownership with her husband Ken Miller. They ran the hotel and served some excellent food until 1998, when it was sold to Lewis Rose and Craig and Heather Heckman. The hotel which had fallen into disrepair was sold to the Ventura Family in 2003 and extensive renovating began inside and out. 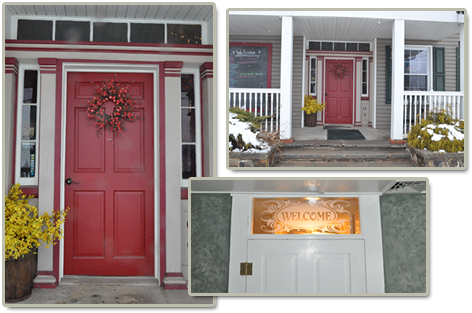 The second floor was turned into a Bed And Breakfast with four new bathrooms, while the first floor was shined and polished to it's glory days. A total renovation of The Hublersburg Hotel was completed in 2005 and renamed the Hublersburg Inn. 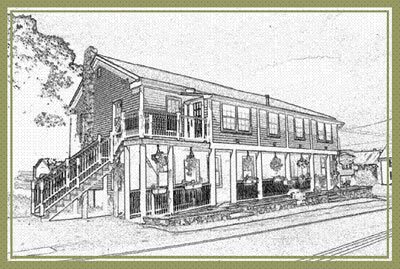 In August 2007 the Inn was purchased by Adrienne (Andi) Heidt, formerly the manager of the Gamble Mill in Bellefonte and a new era of combining great food, service and atmosphere was ushered in. If you haven’t been to the Hublersburg Inn in the past few years you are in for a treat. 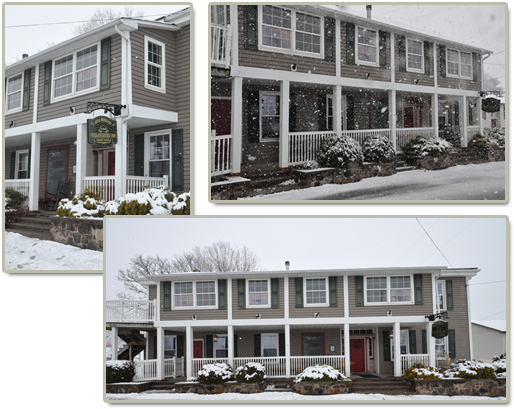 We have become a local favorite, know for our warm, cozy atmosphere, friendly service and quality homemade foods. Meet your friends at the “Hotel”!